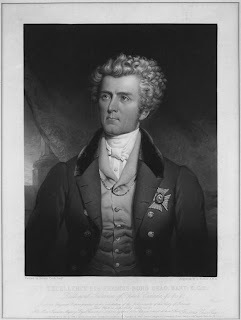 Bond Head (January 1, 1793-July 20, 1875), an author and former soldier, became lieutenant governor of Upper Canada in 1836. As the head of the Family Compact—the corrupt and nepotistic cabal running the colony—he so antagonized the reformers the that a small faction rose up in armed revolt in December 1837 led by William Lyon Mackenzie. 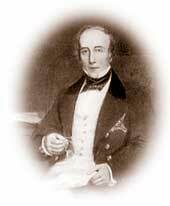 The Colonial Office in London, which so far had ignored angry delegations from Upper Canada such as the one led by Dr. Charles Duncombe in 1836, reacted to the rebellion by replacing the incompetent Bond Head with hard-hearted Sir George Arthur (June 21, 1784-September 19, 1854). 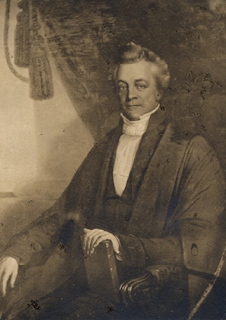 Arthur, former lieutenant governor of the Tasmanian penal colony, immediately started hanging captured rebels. In late March, Bond Head left for New York accompanied by his friend Judge Jonas Jones (May 19, 1791-July 30, 1848), a prominent judge, politician, and businessman. Hoping to slip away unnoticed, Bond Head disguised himself as Jones' servant. They crossed from Kingston to New York State in a small boat and then traveled to Watertown, New York, in a hired wagon. The driver dropped them off at a popular hotel in Watertown. That hotel, owned by Luther Gibson, was then the local headquarters of the Canadian Patriots. Several men recognized and surrounded Jones—who was reported to have looked like a fox cornered by hounds—and regaled him with their political opinions. His servant quietly slipped away. Hugh Scanlan, a friend of Bill Johnston and a Patriot veteran of the Hickory Island raid, noted the long absence of the servant and set out to find him. Scanlan, and Irish-Canadian from Kingston, encountered Bond Head lounging in a wheelbarrow in a nearby stable and saw through his charade. The principal leader of the Upper Canada rebellion, William Lyon Mackenzie, had months earlier posted a reward of £500 for the capture of Bond Head. Scanlan and the other Patriots knew of the reward. So did Sir Francis. Scanlan promised Sir Francis that no harm would befall him and offered to introduce him to the lads. So it came to pass that a clutch of so-called murderous traitors treated their captives—two of the principal elites of the notorious Family Compact—to the best fare the hotel had to offer. Later that day, Bond Head and Judge Jones departed to rousing cheers from the expatriate Canadians. As for Mackenzie's reward money, everyone knew the diminutive firebrand didn't have five pence to his name. Scanlan may have regretted his gentlemanly behavior when four months later Judge Jones sentenced several Patriots to death.